اکبری فر, مهدی, دیواندری, مهدی. (1395). بررسی فصل مشترک کامپوزیت دوفلزی آلومینیم/چدن. علوم و فناوری کامپوزیت, 3(3), 261-268. مهدی اکبری فر; مهدی دیواندری. "بررسی فصل مشترک کامپوزیت دوفلزی آلومینیم/چدن". علوم و فناوری کامپوزیت, 3, 3, 1395, 261-268. اکبری فر, مهدی, دیواندری, مهدی. (1395). 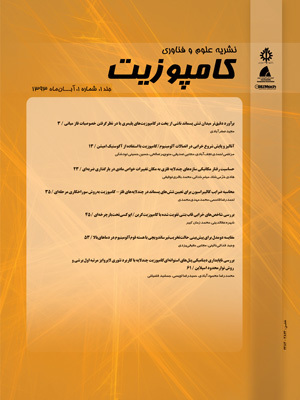 'بررسی فصل مشترک کامپوزیت دوفلزی آلومینیم/چدن', علوم و فناوری کامپوزیت, 3(3), pp. 261-268. اکبری فر, مهدی, دیواندری, مهدی. بررسی فصل مشترک کامپوزیت دوفلزی آلومینیم/چدن. علوم و فناوری کامپوزیت, 1395; 3(3): 261-268. در این مقاله فصل مشترک کامپوزیت ریختگی دوفلزی آلومینیم-چدن خاکستری بررسی شده است. برای دستیابی به یک محصول دو فلزی مناسب و قابل قبول از دو فلز، بررسی مشخصات فصل مشترک آن‌ها ضروری به‌نظر می‌رسد. ریخته‌گری به روش ثقلی انجام شده است. به این منظور مذاب آلومینیم در دماهای 700 و 750 درجه سلسیوس پیرامون مغزه‌های چدن خاکستری درون حفره‌های استوانه‌ای قالب با نسبت حجمی 3، 5 و 8 ریخته‌گری شد. مطالعات بعدی توسط میکروسکوپی نوری، میکروسکوپ الکترونی روبشی (SEM) و طیف‌سنجی تفکیک انرژی (EDS) نشان از تشکیل لایه‌ی ترکیب بین قلزی در فصل مشترک دو فلز داشت. این لایه از ترکیب بین فلزی Fe2Al5 تشکیل یافته است که بر ناهمواری‌های روی سطح مغزه جامد چدن جوانه می‌زند. بررسی‌های ریزساختاری نشان می‌دهند که افزایش دمای بارریزی و نسبت حجمی مذاب/جامد سبب تشکیل لایه‌های ضخیم‌‌تر و یکنواخت‌تر از ترکیب بین‌فلزی می‌شوند. ریز سختی فاز بین فلزی برابر 824 سختی ویکرز به‌دست آمد. پهنای لایه‌ی واکنش از 5 میکرومتر برای نمونه‌ی ریخته شده در دمای 700 درجه سانتیگراد و نسبت حجمی 3 تا 20 میکرومتر برای نمونه ریخته شد در دمای 750 درجه سلسیوس و نسبت حجمی 8 متفاوت بود. در این تحقیق مکانیسمی برای رشد و جوانه‌زنی این فاز بین فلزی در فصل مشترک دوفلزی پیشنهاد شده است. همچنین نحوه حل شدن فاز زمینه چدن در آلومینیم مذاب و دربرگیری گرافیت موجود در چدن خاکستری در مذاب آلومینیم نشان داده شده است. In this article, interface characteristics of aluminum and cast iron bimetal has been investigated. To reach an acceptable composite products, from two materials, interface characteristics needs to be investigated. Aluminum melt was poured, at 700 and 750 ̊C, around cylindrical cast iron bars having melt/solid volume ratios of 3, 5 and 8, respectively. Optical and SEM microscopic observations showed that a reaction layer may form at the interface. This layer is composed of Fe2Al5 intermetallic which forms initially at the rough surface of the insert after making contact with molten metal. Microstructural analysis showed the increasing of temperature and the Vm/Vs ratio leads to formation of a thicker and more uniform intermetallic layer. Microhardness of the Fe2Al5 was 824 HV and the thickness of interaction layer varied from 5μm, for the sample produced at 700 ̊C and 3 Vm/Vs, up to 20μm for the sample poured at 750 ̊C and 8 Vm/Vs. A mechanism is suggested for nucleation and growth of this intermetallic layer and also graphite engulfment of gray cast iron, by aluminum melt, at the interface of two metals. Uthayakumar, M. Prabhakaran, G. Aravindan, S. and Sivaprasad, J. V., “Precision Machining Of An Aluminum Alloy Piston Reinforced With A Cast Iron Insert”, IJPEM, Vol. 10, pp. 7-12. 2009. Manikanadan, G. Uthayakumar, M. and Aravindan, S., “Machining And Simulation Studies Of Bimetallic Pistons”, International Journal of Advanced Manufacturing Technology, Vol. 66, pp. 711-720, 2013. Lenny, J., “Replacing The Cast Iron Liners For Aluminum Engine Cylinder Blocks: A Comparative Assessment Of Potential Candidates”, Msc Thesis, Rensselaer Polytechnic Institute, USA, 2013. Mahendran, G. Balasubramanian, V. and Senthilvelan, T., “Influences Of Diffusion Bonding Process Parameters On Bond Characteristics Of Mg-Cu Dissimilar Joints”, Transactions of Nonferrous Metals Society of China, Vol. 20, pp. 997-1005, 2010. Fernandus, M. J. Senthilkumar, T. Balasubramanian, V. and Rajakumar, S., “Optimizing Diffusion Bonding Parameters To Maximize The Strength Of AA6061 Aluminum And AZ31B Magnesium Alloy Joints”, Materials and Design, Vol. 33, pp.31-34, 2012. Özdemir, N. Aksoy, M. and Orhan, N., “Effect Of Graphite Shape In Vacuum-Free Diffusion Bonding Of Nodular Cast Iron With Grey Cast Iron”, Journal of Materials Processing Technology, Vol. 141, pp.228-233, 2003. Wang, J. Li, Y. and Liu, P., “XRD And TEM Analysis On The Fe3Al/18-8 Stainless Steel Diffusion Bonded Interface”, Materials Letters, Vol. 57, pp. 4323-4327, 2003. Xie, G. Osashi, O. Wada, K. Ogawa, T. Song, M. and Furuya. K., “Interface Microstructure Of Aluminum Die-Casting Alloy Joints Bonded By Pulse Electric-Current Bonding Process”. Material Science and Design, Vol. 428, pp. 12-17, 2006. Çalik, A., “Interface Microstructure Of Diffusion Bonded Ni3Al Intermetallic Alloy And Austenitic Stainless Steel”, Material Letters, Vol. 63, pp. 2462-2465, 2009. Shang, J. Wang, K. Zhou, Q. Zhang, D. Huang, J. and Ge, J., “Effect Of Joining Temperature On Microstructure And Properties Of Diffusion Bonded Mg/Al Joints”, Transactions of Nonferrous Metals Society of China, Vol. 22, pp. 1961-1966, 2012. Kundu S. and Chatterjee S., “Interface Microstructure And Strength Properties Of Diffusion Bonded Joints Of Titanium–Al Interlayer–18Cr–8Ni Stainless Steel”, Materials Science and Engineering A, Vol. 527, pp. 2714-2719, 2010. Timsit, R. S., “Intermetallics Growth At Al/A-Brass Interfaces”, Acta Metallurgica, Vol. 33, pp. 97-104, 1985. Liu, P. Shi, Q. Wang, W. Wang, X. and Zhang, Z., “Microstructure And XRD Analysis Of FSW Joints For Copper T2/Aluminum 5A06 Dissimilar Materials”, Materials Letters, Vol. 62, pp. 4106–4108, 2008. Lee, R. Liu, C. Chiou, Y. and Chen, H., “Effect Of Nickel Coating On The Shear Strength Of FSW Lap Joint Between Ni–Cu Alloy And Steel”, Journal of Materials Processing Technology, Vol. 213, pp. 69–74, 2013. Esmaeili, A. Zareie, H.R. Sharbati, M. Besharati, M.K. and Shamanian, M., “The Role Of Rotation Speed On Intermetallic Compounds Formation And Mechanical Behavior Of Friction Stir Welded Brass/Aluminum 1050 Couple”, Intermetallics, Vol.19, pp. 1711-1719, 2011. Xue, P. Ni, D.R. Wang, D. Xiao, B.L. and Ma. Z.Y., “Effect Of Friction Stir Welding Parameters On The Microstructure And Mechanical Properties Of The Dissimilar Al–Cu Joints”, Materials Science and Engineering A, Vol. 528, pp.4683–4689, 2011. Esmaeili, A. Besharati Givi, M. K. and Zareie Ranjani, H. R., “A Metallurgical And Mechanical Study On Dissimilar Friction Stir Welding Of Aluminum 1050 To Brass (Cuzn30)”, Materials Science and Engineering A, , Vol.528, pp. 7093-7102, 2011. Venkateswaran, P. and Reynolds, A.P., “Factors Affecting The Properties Of Friction Stir Welds Between Aluminium And Magnesium Alloys,” Materials Science and Engineering A, Vol. 545, pp. 26-37, 2012. Zhang, Z. and Zhang, H. W., “Numerical Studies On The Effect Of Transverse Speed In Friction Stir Welding”, Materials and Design Vol. 30, pp. 900–907, 2009. Chen, H. Pinkerton, A. J. Li, L. Liu, Z. and Misty, A. T., “Gap-Free Fibre Laser Welding Of Zn-Coated Steel On Al Alloy For Light-Weight Automotive Applications”, Materials and Design 32, pp. 495–504, 2011. Padmanaban, G. and Balasubramanian, V., “Optimization Of Laser Beam Welding Process Parameters To Attain Maximum Tensile Strength In AZ31B Magnesium Alloy”, Optics andLaserTechnology, Vol. 42, pp. 1253–1260, 2010. Qi X. and Song G., “Interfacial Structure Of The Joints Between Magnesium Alloy And Mild Steel With Nickel As Interlayer By Hybrid Laser-TIG Welding”, Material and Design, Vol.509, pp. 605-609, 2010. Wei, D. Song-bai, X. Ji-yuan, L. Yin-bin-L, and Shui-qing, W., “Torch Brazing 3003 Aluminium Alloy With Zn-Al Filler Metal”, Trans. Nonferrous Met. Soc. China, Vol. 22, pp. 30-35, 2012. Peng, L. Yajiang, L. Juan, W. and Jishi, G., “Vacuum Brazing Technology And Microstructure Near The Interface Of Al/18-8 Stainless Steel”, Materials research bulletin, Vol. 38, pp. 1393-1499, 2003. Liming, L. Shengxi, W. and Limin, Z., “Study On The Dissimilar Magnesium Alloy And Copper Lap Joint By TIG Welding”, Materials Science and Engineering A, Vol. 476, pp. 206–209, 2008. Xu Z. Yan J. Zhang B. Kong X. and Yang S., “Behaviors Of Oxide Film At The Ultrasonic Aided Interaction Interface Of Zn–Al Alloy And Al2O3p/6061Al Composites In Air”, Material Science and Engineering A, Vol. 415, pp. 80-86, 2006. Durgutlu, A. Gülenç, B. and Findik, F., “Examination Of Copper/Stainless Steel Joints Formed By Explosive Welding”, Materials and Design, Vol. 26, pp. 26-32, 2005. Song, J.L. Liu, H. Lin, S.B. Yang, C.L. and Ma, C.G., “Spreading Behavior And Microstructure Characteristics Of Dissimilar Metals TIG Welding–Brazing Of Aluminum Alloy To Stainless Steel”, Materials Science and Engineering A, Vol. 509, pp. 31–40, 2009. Hajjari, E. Divandari, M. Razavi, S. H. Homma, T. and Kamado, S., “Intermetallic Compounds And Anti-Phase Domains In Al/Mg Compound Casting”, Journal of Intermetallic, Vol. 23, pp.182-186, 2012. Zare, G. r. Divandari, M. and Arabi, H., “Investigation On Interface Of Al/Cu Couples In Compound Casting”, Materials Science and Technology, Vol. 29, pp. 190-196, 2013. Papis, K. J. Loeffler, J. F. and Uggowitzer, P. J., “Light Metal Compound Casting”, Science in China Series E: Technological Sciences, Vol. 59, pp. 46-51, 2009. Papis, K. M. Halstedr, B. Loffler, J. F. and Uggowitzer, P. J., “Interface Formation In Aluminium–Aluminium Compound Casting”, Acta Materiala, Vol. 56, pp. 3036-3043, 2008. Papis, K.J.M. Löffler, J. F, and Uggowitzer, P.J., “Interface Formation Between Liquid And Solid Mg Alloys—An Approach To Continuously Metallurgic Joining Of Magnesium Parts”, Materials Science and Engineering A, Vol. 527, pp. 2274–2279, 2010. Socerdote-peronnet M. Guiot E. Bosselt F. Dezellus O. Rouby D. and Viala J. C., “Local Reinforcement Of Magnesium Base Castings With Mild Steel Inserts”, Material Science and Engineering A, Vol. 445, pp.296–301, 2007. Pstrus, J. Fima, P. and Gancarz, T., “Wetting of Cu and Al by Sn-Zn and Zn-Al Eutectic Alloys”, JMEPEG, Vol. 21, pp. 606-613, 2012. Akdemir A. Kuş R. and Şimşir M., “Investigation Of The Tensile Properties Of Continuous Steel Wire-Reinforced Gray Cast Iron”, Material Science and Engineering A, Vol. 528, pp. 3897–3904, 2011. Hajjari E. and Divandari M., “An Investigation On Microstructure And Tensile Properties Of Direct Squeeze Cast And Gravity Die Cast2024 Wrought Al”, Material and Design, Vol. 29, pp. 1685-1689, 2012. Keşlioğlu, K. and Maraşlı, N., “Solid–Liquid Interfacial Energy Of The Eutectoid B Phase In The Al.Zn Eutectic System”, Materials Science and Engineering A, Vol. 369, pp. 294-301, 2004. Baker, H., ASM Handbook, “Alloy Phase Diagram”, 10th ed., Vol. 3, pp. 294-295, 1993. Kuruveri U B, Huilgol P, and Joseph J., “Aluminising Of Mild Steel Plates”, ISRN Metallurgy, pp. 1-6, 2013. Shih, T. and Tu, sh., “Interaction Of Steel With Pure Al, Al-7Si And A356 Alloys”, Material science and engineering A, Vol. 454, pp.349-356, 2007. Shahverdi, H.R, Ghomashchi, M.R, Shabestari, .S, and Hejazi, J., “Microstructural Analysis Of Interfacial Reaction Between Molten Aluminum And Solid Iron”, Journal of material processing technology, Vol. 124, pp. 345-352, 2002. Deqing W, Ziyuan Sh, Longjing Z., “A Liquid Aluminum Corrosion Resistance Surface In Steel Substrate”, Applied surface sciences, Vol. 214, pp. 304-311, 2003. Cheng, W. and Wang, Ch., “Growth Of Intermetallic Layer In The Aluminide Mild Steel During Hot-Dipping”, Surface and coatings technology, Vol. 204, pp. 824-828, 2009. Yin, F. Zhao, M. Liu, Y. Han, w. and Li, Z., “Effect Of Si On Growth Kinetics Of Intermetallic Compounds During Reaction Between Solid Iron And Molten Aluminum". Transactions of Nonferrous Metals Society of China, Vol. 23, pp. 556-561, 2013. Yousaf, M. Iqbal, J. and Ajmal, M., “Variables Affecting Growth And Morphology Of The Intermetallic Layer (Fe2Al5)”, Materials Characterization, Vol. 62, pp. 517-525, 2011. Dutta, M. and Singh, S. B., “Effect Of Strip Temperature On The Formation Of A Fe2Al5 Inhibition Layer During Hot-Dip Galvanizing”, Scripta Materialia, Vol. 60, pp. 643-646, 2009.